Hello from the deep recesses of the Death Star (Library? ), known as the Trash Compacter (Cataloging Department?). Today's blog post is about Star Wars. Most of us grew up with Star Wars. Some of us love it and some of us don't, but the majority of us have been touched by it in some way or another. Lane Library has episodes IV, V, & VI available for checkout in our video collection, but we now also have a collection of Star Wars novels. Some of them are the vintage novels that helped influence the development of the Star Wars universe, while others are a little newer. The Lane has owned a copy of "Splinter of the mind's eye : from the adventures of Luke Skywalker." by Alan Dean Foster for many years. However, there are now other key Star Wars novels available in the collection. 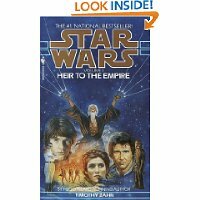 One of these key novels is "Heir to the Empire" by Timothy Zahn. This book is part of an epic cycle known as the Thrawn trilogy and would be worthy of a movie treatment should such a project be undertaken. The Star Wars novels have added to the Star Wars universe in ways that are sometimes surprising. For instance, the first mention of Coruscant, the capitol of the Old Republic and the Empire, is first found in Zahn's book. In order to easily find the books in the Star Wars series, perform an advanced Subject search on "Star Wars Fiction," or an advanced Series Title search on "Star Wars." I hope you enjoy reading these books as much as I have through the years. Please feel free to share your reactions with me to these books as you read them.